By now I’m sure that the vast majority of readers of this blog, if not all, have already read the news about the Happisburg footprints, of almost one million years age, which are coincident with the earliest known dates for archaic human presence in Europe based on other archaeology (H. ergaster or antecessor) and extend their range quite further northwards. So I just want to post a reference, as the study is freely available online for all to read. Investigations at Happisburgh, UK, have revealed the oldest known hominin footprint surface outside Africa at between ca. 1 million and 0.78 million years ago. The site has long been recognised for the preservation of sediments containing Early Pleistocene fauna and flora, but since 2005 has also yielded humanly made flint artefacts, extending the record of human occupation of northern Europe by at least 350,000 years. The sediments consist of sands, gravels and laminated silts laid down by a large river within the upper reaches of its estuary. In May 2013 extensive areas of the laminated sediments were exposed on the foreshore. On the surface of one of the laminated silt horizons a series of hollows was revealed in an area of ca. 12 m2. The surface was recorded using multi-image photogrammetry which showed that the hollows are distinctly elongated and the majority fall within the range of juvenile to adult hominin foot sizes. In many cases the arch and front/back of the foot can be identified and in one case the impression of toes can be seen. Using foot length to stature ratios, the hominins are estimated to have been between ca. 0.93 and 1.73 m in height, suggestive of a group of mixed ages. The orientation of the prints indicates movement in a southerly direction on mud-flats along the river edge. Early Pleistocene human fossils are extremely rare in Europe, with no evidence from the UK. The only known species in western Europe of a similar age is Homo antecessor, whose fossil remains have been found at Atapuerca, Spain. The foot sizes and estimated stature of the hominins from Happisburgh fall within the range derived from the fossil evidence of Homo antecessor. Figure 8. Vertical image of Area A at Happisburgh. a. Model of footprint surface generated from photogrammetric survey showing the 12 prints used in the metrical analyses of footprint size; b. Plot of length and width measurements of 12 prints showing possible individuals. Means and standard deviations for foot length and age for modern populations are also shown. 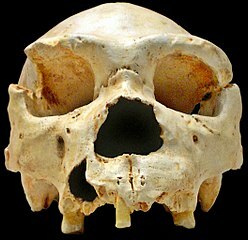 About half an hour ago, somewhat cryptic comments in this blog and my email woke me up, more abruptly than I would have desired maybe, to a new game-breaking finding: researchers have sequenced the mtDNA of a 400,000 years old Homo heidelbergensis from Atapuerca (Iberian Peninsula, Europe) and it was not at all like most would have expected. Excavations of a complex of caves in the Sierra de Atapuerca in northern Spain have unearthed hominin fossils that range in age from the early Pleistocene to the Holocene1. One of these sites, the ‘Sima de los Huesos’ (‘pit of bones’), has yielded the world’s largest assemblage of Middle Pleistocene hominin fossils2, 3, consisting of at least 28 individuals4 dated to over 300,000 years ago5. The skeletal remains share a number of morphological features with fossils classified as Homo heidelbergensis and also display distinct Neanderthal-derived traits6, 7, 8. Here we determine an almost complete mitochondrial genome sequence of a hominin from Sima de los Huesos and show that it is closely related to the lineage leading to mitochondrial genomes of Denisovans9, 10, an eastern Eurasian sister group to Neanderthals. Our results pave the way for DNA research on hominins from the Middle Pleistocene. Figure 4: Bayesian phylogenetic tree of hominin mitochondrial relationships based on the Sima de los Huesos mtDNA sequence determined using the inclusive filtering criteria. All nodes connecting the denoted hominin groups are supported with posterior probability of 1. The tree was rooted using chimpanzee and bonobo mtDNA genomes. The scale bar denotes substitutions per site. It has been argued by all sides (myself included) that the H. heidelbergensis of Atapuerca and other European locations are ancestral to Neanderthals. Some say that also to H. sapiens, while others argue that ours is a wholly distinct line, derived from H. rhodesiensis, and yet others claim that H. rhodesiensis is not different from H. heidelbergensis in spite of being older and rooted, it seems, in South Africa. The clear evidence for migrations out of Africa, before our species, is limited to two periods: (1) the c. 1.8 Ma old migration of H. erectus/georgicus with Olduwayan technology (mode 1, “choppers”), and (2) the c. 1 Ma old migration of H. ergaster/antecessor (sometimes also confusingly called H. erectus) with Acheulean technology (mode 2, typically “hand axes”). Archaeological evidence for later migrations does not exist. See: Late human evolution maps at Leherensuge. So we could well ask, if H. heidelbergensis is not ancestral to Neanderthals, then where do Neanderthals come from? It must be answered that we do not know yet if H. heidelbergensis is or not ancestral to Neanderthals or in what degree it is. The mitochodrial (maternal) lineage may well be misleading in this sense. 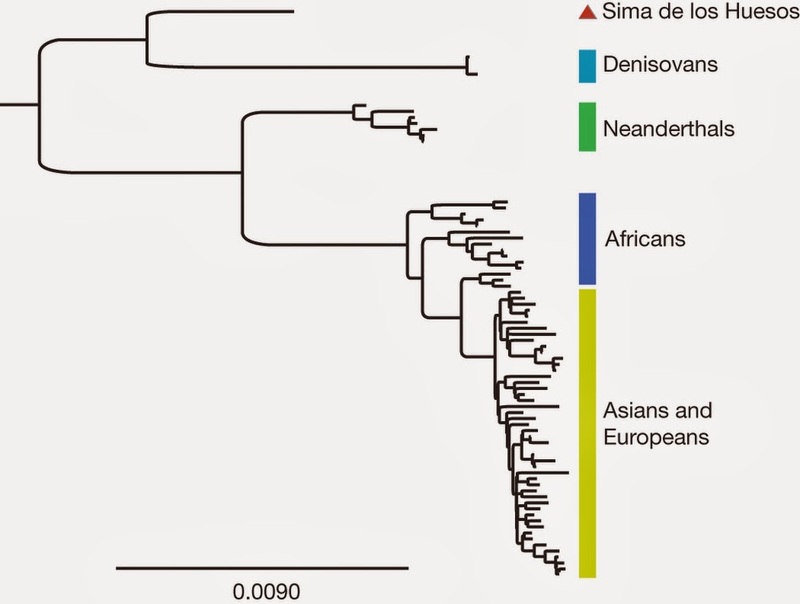 Denisovans themselves were much more related to Neanderthals via autosomal (nuclear) DNA than the mtDNA, so it may also be the case with European Heidelbergensis. In fact it is still possible that these individuals represent some sort of admixture between older and newer layers of human expansion. But there is no clear answer yet. What is clear is that no Neanderthals have these mitochondrial sequences but others closer to those of H. sapiens – and this is the most puzzling part in fact. But one thing is clear: the World is much bigger than just Europe, and that was also the case back in Paleolithic times. Our answer may well lay under the sands of some tropical desert, the waters of the sea or whatever other place in Asia or Africa. Even if we’d find the “missing link”, so to say, we might not be able to discern it as such without genetic sequencing and that is often not even possible at all. However this pioneer research, as well as its precursors on a bear also from Atapuerca and a 700,000 years old horse (the true record of ancient DNA recovery), give us some hope of getting an improved, even if sometimes perplexing, understanding of the complexity of the human adventure. A new date obtained in the Catalan site of Boella confirms very old presence of Acheulean stone technology (and therefore, inferred, of Homo ergaster, common ancestor of Neanderthals and our species) in SW Europe, up to one million years ago. In 2009 it was also reported comparably old dates for this key techno-culture in SE Iberia, specifically c. 780,000 BP in Zamborino (Andalusia) and 900,000 BP in Cueva Negra (Murcia). So this date should not be any surprise, however it confirms the overall scenario for a very old Acheulean in the Iberian peninsula. Acheulean technology, usually associated with H. ergaster, appeared first in Africa c. 1.6 Ma ago, and spread to Palestine c. 1.4 Ma ago, with South Asian and Iberian sites following in antiquity (surely both older than 800,000 BP). Fragments of a human skull dated to some one million years ago have been found at Muhuli Amo, Eritrea. They are probably correlated with a previous finding of hundreds of Acheulean tools. Sources: The Archaeology Network, Pileta, Noticias de Prehistoria[es]. Well, maybe the title is a bit of a hype but something like that seems to be the most relevant finding on the Acheulean of Konso (SNPP region, Ethiopia): that the technique stood the same for a million years and then, some 800,000 years ago, became more refined in which was apparently one of the first technological leaps of archaic Humankind. Specifically it is the edges of the handaxes (the archetypal Acheulean finding, which may have been more a knife of sorts than a true axe) which became more refined and apt for its cutting purpose. The Acheulean technological tradition, characterized by a large (>10 cm) flake-based component, represents a significant technological advance over the Oldowan. Although stone tool assemblages attributed to the Acheulean have been reported from as early as circa 1.6–1.75 Ma, the characteristics of these earliest occurrences and comparisons with later assemblages have not been reported in detail. Here, we provide a newly established chronometric calibration for the Acheulean assemblages of the Konso Formation, southern Ethiopia, which span the time period ∼1.75 to <1.0 Ma. The earliest Konso Acheulean is chronologically indistinguishable from the assemblage recently published as the world’s earliest with an age of ∼1.75 Ma at Kokiselei, west of Lake Turkana, Kenya. This Konso assemblage is characterized by a combination of large picks and crude bifaces/unifaces made predominantly on large flake blanks. An increase in the number of flake scars was observed within the Konso Formation handaxe assemblages through time, but this was less so with picks. The Konso evidence suggests that both picks and handaxes were essential components of the Acheulean from its initial stages and that the two probably differed in function. The temporal refinement seen, especially in the handaxe forms at Konso, implies enhanced function through time, perhaps in processing carcasses with long and stable cutting edges. The documentation of the earliest Acheulean at ∼1.75 Ma in both northern Kenya and southern Ethiopia suggests that behavioral novelties were being established in a regional scale at that time, paralleling the emergence of Homo erectus-like hominid morphology. Fig. 4. Handaxe refinement through time. Upper, dorsal; Lower, ventral. From left to right, two each are shown from KGA6-A1 (∼1.75 Ma), KGA4-A2 (∼1.6 Ma), KGA12-A1 (∼1.25 Ma), and KGA20 (∼0.85 Ma). In each pair of handaxes from the respective sites, near-unifacial (left) and more extensively bifacial (right) examples are shown (except with the KGA20 handaxes, which are both well worked bifacially). 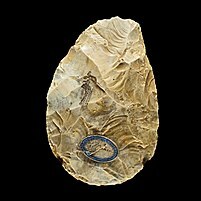 I am a bit intrigued by the all-covering work style of the last handaxes, which remind somewhat to the later MSA technology, which belongs already to Homo sapiens. Our species may have also evolved in that very area of the Nile Basin, with the oldest specimen known being from nearby Omo River. Other sources: Pileta, NBC News. In contradistinction to the >1.2-Ma assemblages, the younger ∼0.85-Ma Konso Acheulean is characterized by considerably refined handaxes. Some of these handaxes are refined to the extent that they would qualify as approaching “three-dimensional symmetry” (i.e., symmetric not only in plan view but also in cross-section form) (Fig. 4 and Fig. S2). Some suggest that manufacturing 3D symmetric tools is possible only with advanced mental imaging capacities and that such tools might have emerged in association with advanced spatial and navigational cognition, perhaps related to an enhanced mode of hunting adaptation. 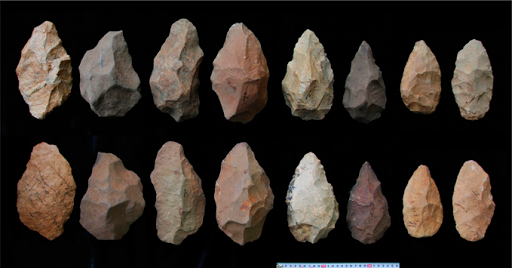 It has been pointed out that purposeful thinning of large bifacial tools is technologically difficult, even in modern human ethnographic settings. In modern humans, acquisition and transmission of such skills occur within a complex social context that enables sustained motivation during long-term (>5 y) practice and learning. In light of the above information, it is of interest that our metric analysis shows that there may be a fundamental difference between the handaxe technologies of >1.2 and ∼0.85 Ma. Whereas refinement of handaxe shape did occur from ∼1.6 to ∼1.2 Ma, this refinement did not result in tool thinning and advanced 3D symmetry.